Relebactam is a β-lactamase inhibitor of class A and class C β-lactamases, including carbapenemases. We evaluated the ability of relebactam to restore imipenem susceptibility against a collection of Klebsiella pneumoniae isolates from Greek hospitals. 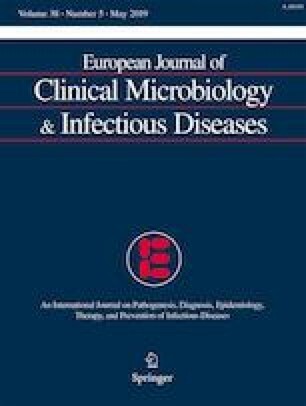 We tested 314 non-MBL carbapenemase-producing K. pneumoniae consecutive clinical strains isolated from unique patients at 18 hospitals in Greece, between November 2014 and December 2016. Susceptibility testing of imipenem, imipenem-relebactam, meropenem, doripenem, gentamicin, and colistin was performed using broth microdilution. Additionally, MICs of ceftazidime-avibactam, fosfomycin, and tigecycline were determined by MIC Test Strips. MICs were interpreted per EUCAST breakpoints. Imipenem-relebactam MICs were interpreted using the breakpoints proposed for imipenem. Carbapenemase genes were detected using PCR. Whole genome sequencing was performed for selected isolates. Imipenem-relebactam inhibited 98.0% of the KPC-producing isolates at ≤ 2 mg/L (MIC50/90, 0.25/1 mg/L) and was considerably more active than imipenem (MIC50/90, 32/> 64 mg/L). Reduced activity of imipenem-relebactam was rarely detected (2%) and was associated with chromosomal factors (ompK35 disruption and/or mutated ompK36). Only ceftazidime-avibactam showed in vitro activity comparable to imipenem-relebactam (99.6% susceptible). Relebactam provided only weak potentiation of imipenem activity against K. pneumoniae with class D OXA-48-like enzymes. Relebactam exhibited strong potential for restoring the in vitro activity of imipenem against KPC-producing K. pneumoniae, lowering the imipenem MIC50 and MIC90 from 32 to 0.25 mg/L, and from > 64 to 1 mg/L, respectively. Production of KPC carbapenemase represents the main cause of carbapenem resistance among K. pneumoniae in Greek hospitals (66.5%), and this carbapenemase appears to be very well inhibited by relebactam. The authors would like to acknowledge the staff from the Microbiology Departments of the 18 participating hospitals, for providing the test isolates. Some of these data were presented at the 28th European Congress of Clinical Microbiology and Infectious Diseases, 2018, Madrid, Spain (abstract P1048). Funding for this research was provided by MSD - Merck Sharp & Dohme, Hellas. IG has received research grand and speaker honorarium from ACHAOGEN and speaker honorarium and financial support for attending symposia from MSD; MS has received research grand from ACHAOGEN; HG has received research grand from Pfizer; AA has received research grand by MSD. All other authors: none to declare. The funding company did not participate in the study design, data collection, analysis, or, interpretation of data preparation of the manuscript, and the decision to submit the manuscript for publication.